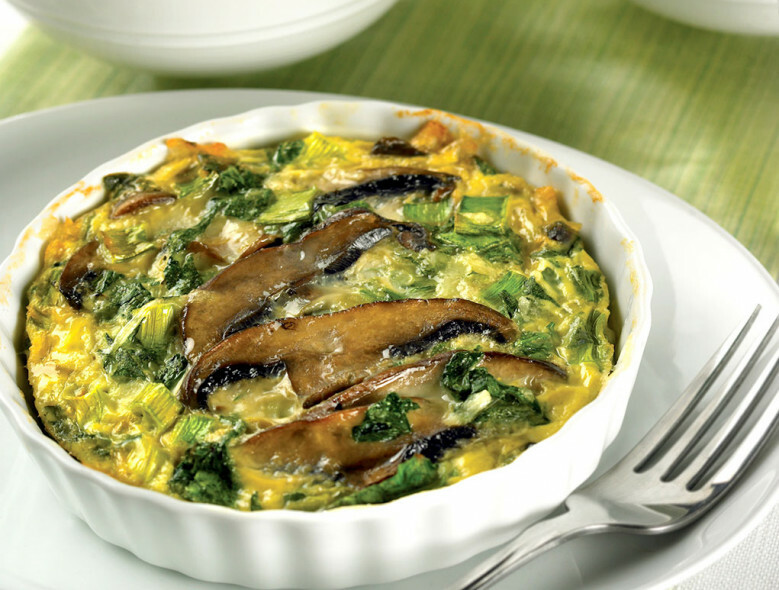 This hearty quiche is perfect for breakfast in bed, but also makes a great entrée for lunch or dinner! Preheat the oven to 350° F. Lightly spray two 10-ounce ovenproof custard cups or individual pie pans with cooking spray. Place on a shallow baking sheet. In a large non-stick skillet, heat the oil over medium heat, swirling to coat the bottom. Cook the mushrooms and green onions for 2 minutes, stirring occasionally. Stir in the port. Reduce the heat to medium low and cook for 3 to 4 minutes, or until all the liquid is absorbed. Stir in the garlic and cook for 30 seconds to 1 minute, or until fragrant. Remove from heat. Add the spinach. Using a spoon, separate it into small pieces. Put the cornstarch in a medium bowl. Pour in the milk, whisking to dissolve. Whisk in the remaining ingredients. Stir in the mushroom mixture. Pour into custard cups. Bake for 30 minutes, or until the centers are puffed and set (don’t jiggle when gently shaken). Let stand for 5 minutes before serving.